Adobe Flash on Mac OS X provides a mechanism for users to check the version of Flash on their system to make sure it is not out of date. This can be done via the somewhat new "Flash Player" System Preference Pane, which has a "Check Now" button to trigger a version check. When users click on the Check Now button, the URL loaded is an HTTP URL and thus man-in-the-middle attackable. The current version of Flash Player's System Preference Pane loads http://www.adobe.com/go/flash-player-updates which redirects the user to https://www.adobe.com/software/flash/about/. Since Adobe has a more secure download mechanism built into Flash already, surely instead of making the "Check Now" button put users at risk, they could simply trigger that code path. Somehow this issue, as obvious as it is, and despite my best attempts at getting them to fix it, has still not been fixed in the latest version. I believe Adobe has a responsibility to its users to do the right thing here. It makes me want to ask someone at Adobe how something as basic as this does not fit into their secure development lifecycle. Now that a few days have passed I wanted to provide a full walkthrough of the Safari extension exploit for Mac OS X, as I thought it might be useful for someone in reproducing the bug or for using in new research. Synopsis: Leverage the directory traversal in Safari Extensions using 1Password's extension as an example. Note that the bug and vulnerability are not in 1Password. The test case shown describes the files that would be placed on an Apache website to reproduce the vulnerability as I did. The purpose of this page is to get 1Password to offer to save a password. We do this with an auto-submitting form. The form submits to passgrabber.html. At the start of the previous page, this is loaded into an iframe. Its purpose is to perform the "carpet bombing" (obligatory shout out to Nitesh Dhanjani again), otherwise called a forced download. There are a million ways to accomplish this, but I used the following .htaccess and HTML. Header set Content-Disposition "attachment; filename=interzone.html"
Here you put your payload. You can do what you want from stealing files to executing SQL in the extension's database. When the download starts, Safari will create a temporary download bundle in the victim's ~/Downloads directory. It will be called "interzone.html.download/" and will contain a file called "interzone.html" inside it. You'll remember that is our "poc_target". We use this path because the Safari sandbox allows us to read files while they are being downloaded. You can put whatever payload you like in this file, but you need to make sure that it is either large enough in size or being served slow enough that the download is still in progress by the time it gets called. Actually, there are a million ways to do this too, but the easy route I took was making it 40 megs. If the download completes before the file is called, the temporary bundle will be removed before the exploit can access it. At this point, we have triggered 1Password, taken its dynamic value, validated that it works for us in a directory traversal, and we have pushed a payload to the victim's system. While the victim's system is downloading the payload, we can reliably access it and load it into the iframe from a safari-extension URL and in the context of the affected extension. There are clearly lots of ways to accomplish this, but I chose the simplest path, not the most covert. That said, there are many points along the way where exploiting could have been made more difficult. If I had not been able to push files to the user, guess the download path, access the temporary download directory, or create frames that access safari-extension URLs in a remote web page, it would have been trickier. Safari is vulnerable to a directory traversal issue with the handling of "safari-extension://" URLs. Attackers can create malicious websites that trigger Safari to send files from the victim's system to the attacker. "Your injected scripts can access resources—images, HTML, and other scripts, for example—within your extension folder. Relative URLs are relative to the webpage your script is injected into, however. If you need to access local resources, use safari.extension.baseURI + “relative path and filename”. You cannot access resources on the user’s hard drive outside of the extensions folder." Due to a directory traversal vulnerability in the handling of these URLs, any file readable by Safari's sandbox can be accessed by attackers. In these URLs, the only component that is not generally known to attackers is the dynamic value. The dynamic value is a 32bit number represented as a lowercase hex string. While there are attacks that could attempt to guess this value, more effective routes to exploit this issue have been found. These URLs may be used by content injected into web pages, exposing the dynamic value by reading the DOM. The method and exploitability depends on the code in the extension, but proof of concepts have been generated that work against the 1Password, ClickToFlash, and several other extensions. This should not be considered a security vulnerability in those extensions. They are following the guidelines provided by Apple for what should be a safe operation. The vulnerability here is that safari-extension URLs, with the help of directory traversal, have the ability to access local resources anywhere the system will allow the process to read. Apple's Safari Extensions website claims that they are sandboxed. This was verified when accessing the site with Safari for both Mac OS X and Windows 7. However unlike Mac OS X, successful exploitation on Windows can access files wherever the user can read. It seems that sandboxing is either not implemented for Safari on Windows 7 or that the sandboxing does not limit file reading. * Sandbox limits the badness that can be done with Safari exploits on Mac OS X. Hopefully Safari will adopt more process separation to further limit the damage possible from vulnerabilities. There's not a ton to say about this bug aside from "Yikes"! I think the PoC speaks for itself. This allows you to send any "file:" url to LaunchServices, which will run binaries, launch applications, or open content in the default application, all from a web page. The only caveat is that since LaunchServices will check for the quarantine bit, you cannot directly push a binary to the browser and launch it. Other than that, you can run or launch anything you can access by using the method in the html provided below. Previous versions may be affected but were not tested. Man-in-the-middle (MITM) bugs are well known to security researchers and often lead to information disclosure that can result in session hijacking or leaking personal information. MITM attacks that result in execution of arbitrary commands on a victim's computer seem less common. This was not always the case. It used to be fairly common to see applications that had built in update mechanisms not bothering to use any secure method to grab new code. These days it is expected that new code will be validated with some form of cryptographic mechanism or be provided to the user over a secure channel before being executed. Without these safeguards in place it would be possible for attackers to hijack the update unless you had a fully trusted network connection between your computer and the vendor. Since that is not the case most of the time, most reputable software vendors implement these mechanisms to protect their updates. Unfortunately, this is not always done on Mac OS X when help books are updated. serverVersionURL = serverBaseURL + "helpbook-version.txt"
localVersionURL = directoryPath + "helpbook-version.txt"
Here's the source of the test page used in the screen capture. 1. Help book documents are only accessible via URL after they are registered, which occurs after being opened once. In order for the demonstration above to work, the help book from the Mac App Store must have been opened at least once. 2. This bug is an issue for more applications than just Mac App Store. It is an issue for any application that insecurely transfers help book content or does not validate it in some way before it is executed. Finding the other applications distributed with Mac OS X as part of the base distribution vulnerable to this issue is a (simple) exercise for the reader. An attacker could trigger several help books at once with the hope of infecting just one. 3. This demonstration was noisy and obvious, but an actual attacker could be much sneakier. 2. 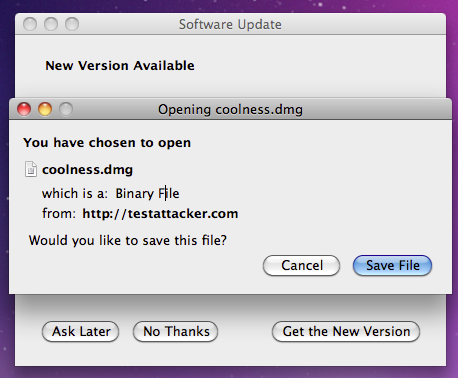 This filename is then passed to the update scripts, which write to this file during update. Apple has addressed these issues in Security Update 2011-006. It can be installed via Software Update. 1. Apple should have signed and validated this code, or at the very least made sure that the help book was sent over a secure channel. Apple should scan all other help books they provide for variants of these issues. Apple should also reach out to third-party developers to help them avoid these same mistakes. 2. Install the security update that addresses this issue. All the websites and applications you use in Safari are sandboxed, so they don’t have access to information on your system. If a website contains malicious code intended to capture personal data or tamper with your computer, sandboxing provides a built-in blocker that restricts the code from doing harm." In today's security update, Apple is fixing in two security issues I reported that could lead to capturing personal data and launching of arbitrary files or commands to tamper with your computer. These security holes do not break the Mac OS X sandboxing technology. Instead they function despite the sandboxing due to the way sandboxing for Safari was implemented. I believe these are the first security holes in Apple software that have been made public that achieve file theft and command execution against Safari on Mac OS X v10.7 since sandboxing was added. Of course this excludes the many, many, many holes in Flash and Java and other third party software one may have installed. The first issue allows a malicious website to run arbitrary commands by getting Safari to launch a URL directly to the system. This issue is tracked as CVE-2011-3230. Two other issues in Mac OS X were fixed as well. The second issue is a MITM attack Brian Mastenbrook and I found that leads to execution of arbitrary code. When viewing help in the Mac App Store, an update check is performed by talking to an Apple server. This update includes AppleScript and Python code that are served over HTTP, and can be replaced by an attacker with the ability to alter the victim's network traffic. When updating, these files are executed. If Mac App Store help has ever been viewed before, this update check can be triggered on demand by an attacker using a "help:" URL in a web page. Additionally, even when a network attacker is not present, the update process insecurely accesses files in "/tmp" leading to a traditional Time of Check vs Time of Use condition that could lead to local attacks such as privilege escalation. These issues do not affect Mac OS X v10.7 Lion, presumably because they were reported to Apple prior to its release. These issues are collectively tracked as CVE-2011-3224. I hope the detailed information on these security holes is useful. If you have any questions feel free to post them. This appears to get executed on every Chrome update, offering attackers frequent opportunities to attack the statically named, insecurely created temporary file. To exploit this issue, a local attacker would create a symbolic link from "/tmp/.keystone_install_lock" to a file they wanted to have created by the victim. When created, the files will be created with permissions that allow reading and writing by all users of the system. There are a number of files that users can write in their home directories that control access to various resources. Using this method to create such files could allow an attacker to then edit the content of those files and lead to local privilege escalation or information disclosure. In today's update, Apple is fixing a security issue that was disturbing for me to see, but is definitely not even close to the most serious security holes in the update (there are several that look like they would be useful in creating drive-by -> code execution). Just for the sake of documenting this bug fully, here are some details. The issue only affects MobileMe users and is that upon attempting to compose your first email after launching Mail.app, cleartext requests are made to Apple servers and return back a list of your email aliases. When users want to secure the traffic from Mail.app, they would typically enable SSL for incoming and outgoing mail, which happens to be the default for MobileMe accounts, and also likely disable the loading of remote images. I should note that in my tests, downgrading from digest authentication to basic authentication failed to leak the user's MobileMe password. So unlike in the case of the CVE-2010-3831, which I found using the same old silly proxy server method, this was far less serious. Though it is worth noting a web page can trigger this behavior simply by pushing your browser to a "mailto:" URL, so it could be done on demand assuming Mail.app isn't already running. Not that it should be a surprise to anyone, but I was also able to spoof a response from the server that caused my available "From" addresses to include attacker created/injected email addresses. I was not able to make mail use any of these addresses by default on creation of new mail. Regarding iCloud, I hope that Apple is taking this opportunity to make it so that bugs like this are mitigated through design. If you have a fancy new web service, why not kick it off by doing all the things you're supposed to. For example, if they allow HTTP/unencrypted access to iCloud services I will be really disappointed. HP released a bulletin covering CVE-2011-1531, CVE-2011-1532, and CVE-2011-1533 on April 12 that acknowledges these security issues I reported to them exist, but will not be providing a patch to address them. Instead, they have provided some recommendations and workarounds. Some of the recommendations are not very practical in real life, such as avoiding XSS by "Exposure can be reduced by avoiding untrusted URLs". This is not because they didn't understand the problem, but because there was nothing much else to say when they weren't going to fix the issue. There's more than one place to XSS this but I like the error page of the printer because it is accessible even with authentication enabled. You can trigger it with a POST to refresh.htm, which will result in unescaped output provided to it in the "refresh_rate" variable. I appreciate that HP took the time to disclose the bugs, but it makes me wonder what my expectations should be for them to fix any other HP products. Perhaps XSS is just below their threshold, or maybe they think printers are not worth fixing. It's hard to tell what they would care enough to patch. 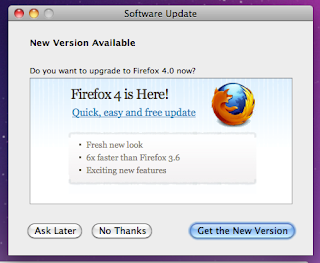 Earlier today I was proved wrong when I claimed it was not possible to update from Firefox 3.x to 4.x securely. I'm not quite sure what happened when I originally tested it -- potentially it was something to do with one of their security updates going out, but in any case, this got me looking at how their updates work. It turns out that the user-readable details about the new version are pulled as plaintext HTTP from Mozilla's servers. I wondered what would happen if I added a meta refresh to another download in this page. Below is the edited HTML using Charles Proxy but clearly any man-in-the-middle attacker could do the same thing. The result of this is an arbitrary file being pushed to you at the time you are trying to update. I personally think this could be convincing enough to get people to run malicious code. An attacker could also edit the HTML directly to make it seem like you should click a button in the untrusted frame instead of the "Get the New Version" button or be even more creative. I think it is important for software vendors like Mozilla to keep these kinds of attacks in mind when mixing application chrome and untrusted content in the same view. It is important for us to think of the barely computer literate user who is just trying to safely browse the web. I'm pretty sure more badness could be done with this, and the fix is relatively simple -- all they needed to do was serve this over SSL and the threat would be greatly reduced. - A web page could open a url with the x-mini-installer:// scheme, with a host and path of where to attempt to load files. - When an update package fails to process properly, the UI displayed instructs a user to run something from their ~/Downloads folder, where a malicious file could have been dropped. - I did not succeed in getting it to automate the install of arbitrary content. As a follow-up to this post on how most LWP-based scripts can be man-in-the-middled, I contacted Jesse Vincent, Gisle Aas, and the Perl security team about this LWP issue. They immediately saw the issue and began fixing it. I would strongly recommend using LWP 6.00 for anything that needs to handle an HTTPS URL. The libwww−perl (LWP) module Net::HTTPS did not fully validate SSL certificates by default prior to version 6.00. Multiple Perl modules (such as WWW::Mechanize and LWP::UserAgent) do not enable full validation of SSL certificates when using libwww-perl, leaving software that uses them vulnerable to man-in-the-middle attacks. This issue was addressed by changing the default behavior of libwww-perl to enable full validation of SSL certificates. For https://... default to verified connections with require IO::Socket::SSL and Mozilla::CA modules to be installed. Old behaviour can be requested by setting the PERL_LWP_SSL_VERIFY_HOSTNAME environment variable to 0. The LWP::UserAgent got new ssl_opts method to control this as well. Thanks to all of their hard work, lots of projects that previously did not validate certificates will begin to do so, once LWP is updated. The problem is that when internally generated pages (such as error pages) are loaded, they are loaded from the local "file:" zone, but the window's location can still be set by all scripts that have a reference to the window, such as an attacker's website. Safari normally blocks loading of local content from remote sites for a ton of reasons. One reason is that local content in Safari has a fair bit of power*, including the ability to read any file accessible to the current user. This can be accomplished a number of ways. The easiest is using XMLHttpRequest()s in order to read files by "file:///" URL. Once loaded, the content can be sent anywhere. *To read about the many other things that local HTML can do, check out the related reading links below. Because of how Safari displays its error pages, we now have a window in the local "file:///" zone, but triggered by a load of an "http://" URL. The vulnerability exists in the fact that this window, with full access to the "file:///" URLs, can be navigated by its parent window, when it should be blocked by a security check. We can navigate this child window by setting x.window.location, and can set it to any URL including those in "file:///". All we need in order to exploit it is some malicious HTML to point at using a "file:///" URL. 1. Does the pop-up blocker stop this bug? 2. 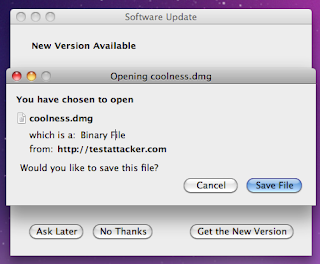 What if I changed my preferences so that 'Open "safe" files' is not selected? Am I safe against this? No. The slightly more technical explanation for this answer is that my proof of concept is using a disk image just to get malicious content at a known local path. There are a lot of other ways to accomplish this task. For example, my original proof of concept used an "ftp://" URL, and triggered Finder.app to automatically mount the site in /Volumes. I felt like setting up a public FTP server was a bit of a hassle so I switched to this easy and portable version. There are also less obvious ways to do this, including methods that involve no user-visible clues that a malicious file is now accessible through a "file://" path. 3. Will the Mac OS X file quarantine feature stop this exploit? No. While we're using a disk image that came from Safari and this file is therefore quarantined, we are not launching our payload. Instead we are loading it from an active HTML document that has already been loaded into the "file://" zone. 4. Your proof of concept did not work for me. Does that mean I am not vulnerable? 5. Will this work on Windows? Good question. I suspect that it will, and that using a UNC path you might be able to point at remote files for your payload. However I have not had a chance to test this. If you have a test system and a moment to port this to Windows, I'd appreciate it if you would post a comment. I'd also like to know if you can launch programs from this local window by using document.location or by loading a JAR in the "file://" zone. That could be interesting. 6. Is Safari the only browser affected? No. Safari is the only browser that this proof of concept was designed to work with, but the bug itself is in WebKit and affects other WebKit-based browsers. If you are testing your WebKit-based browser, remember that if you use a different URL scheme for things like these error pages, you may need to modify the test case to attempt to access resources using that scheme instead of "file://". I would like to thank Cedric of the Apple Product Security team for the responsive and responsible handling of this issue. I would also like to thank the Google Security Team for putting in the effort to harden WebKit against many of these issues and protect their users.